Huge slabs of bluish colored ice covering the waters of Paradise Harbour in Antarctica. Are you a color photographer who also likes to experiment with the occasional venture into the world of black and white photography? Have you thought about what determines your choice of a black and white or color rendering? Can you see the outcome, in your mind’s eye, before you release your camera’s shutter or do some of your photos end up as black and white after some experimentation on the desktop? Antarctica is a singularly unique and vast continent. A sea journey to the Antarctic Peninsula will see you cross a blue-grey melancholic ocean to a world of ice, water and rock. The dominant colors in Antartica are white, blue, grey and black, with the occasional splash of yellow or orange on a penguin or in their krill-based poop. 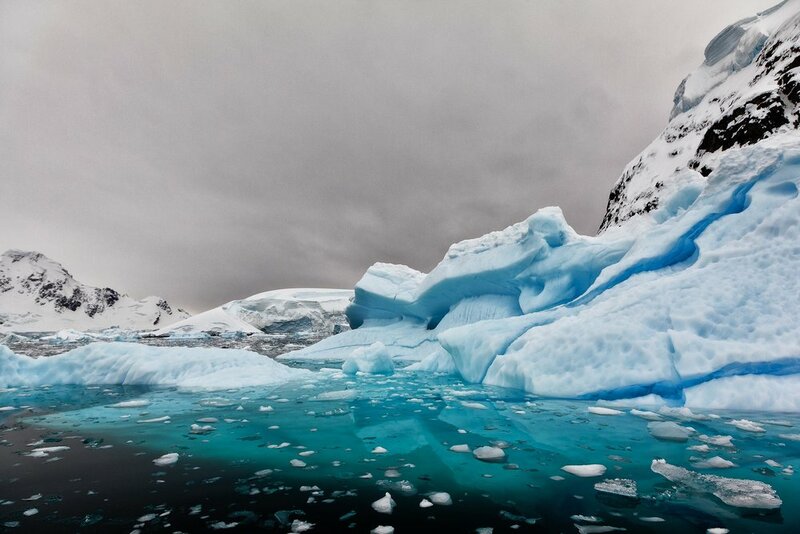 Have no doubt Antarctica is a truly spectacular, pristine and dangerous environment displaying a very sombre beauty. From the deck of the Polar Pioneer, breaking through pack ice, as we journey along the Lemaire Channel in Antarctica. I was fortunate to co-run a photography tour to Antarctica. The tour was 19 days in length and, due to the significant distances involved, included days at sea as we crossed, back and forth, from Argentina to the Antarctic Peninsula. Once you’ve made it to Antarctica the bays and channels around the Antarctica Peninsula are actually quite calm. Except for the few laid up with sea sickness we made the most of our time at sea photographing sea birds flying around the back of our ship, the Polar Pioneer; socializing; or downloading and processing our images, often in common areas like the bar or the dining room. Three Gentoo penguins carefully making their way down a slippery slope at Port Lockroy in Antarctica. On one such day several people commented on photographs I was working on at the time. The comments, while complimentary, were a little guarded due to the fact that I'd decided to render the images in question into black-and-white. I thought I'd take this opportunity to discuss my thought process and probably why my approach didn't coincide with those made by other members of the group. The photo of the three Gentoo penguins was made under relatively bright and high contrast conditions. There was almost no color in the scene and the tones and textures in the image made it an obvious choice for rendering into black and white. It’s really that simple, but the choice for a black and white rendering is what saved the image. Sure it’s a cute scene, as Larry, Curly and Moe gingerly make their way down the slippery slope. But it just wouldn’t have been so attractive if I’d kept the image in color. The same is true for this black and white image of a shelter which functions as accommodation for the research scientists who live at Port Lockroy on Wiencke Island in Antarctica. As soon as I saw the shapes, textures and tonality within the scene I knew this image would end up as a black and white photo. By removing what’s not important, in this case the color, those other elements of composition really come to the fore. Color and texture dominate in this panoramic view of a large iceberg in Paradise Harbour, Antarctica. Antarctica is an amazing location for landscape photography, but one thing that’s inescapable about Antarctica is color. And it’s in the water, sky and, in particular, the icebergs where color resides in Antarctica. So, with that in mind, it's not surprising that some folks might wonder why I opted for a different approach, albeit on a very small percentage of my images. We all go through stages in our photographic life. For years I used medium strength telephoto lenses in my landscape photography. These days I prefer wide-angle lenses. Likewise, while many folks love using long telephoto zoom lenses for portraiture, I've always preferred to work with mild wild-angle and medium telephoto lenses. I've always loved working in color but, since 1986, when I first started studying the history of photography, I've very much enjoyed looking at classic black-and-white photos. These days I try not to be boxed in by images or preconceptions about a particular location that I’m yet to visit. So, while it’s true that many of the icebergs in Antarctica are often an amazing cyan/blue color, that doesn’t mean all the photos I make of icebergs in that part of the world will stay in color. I think it’s important, wherever possible, to make images that separate you from the crowd by their uniqueness as much as by their quality. And, if it’s good for you to do so, it probably is for me as well. In your own search for a photographic style or identity it’s a good idea that you aim to discover and cultivate your own unique way of seeing the world and let that inform your photography practice. What Are Your Photos All About? As far as photography is concerned it's a fact that some subjects or scenes look better in black-and-white. The trick is to let the image you've created tell you whether it’s best suited to color or black-and-white. Lines, shapes, textures and shadows will appear more dominant in a black and white photo. Likewise the color of the light, or the relationship between either complimentary or harmonious colors may demand a color rendering in the final photo. The question that matters is which treatment will best convey the feeling, mood, theme or subject you want to explore. Learn To Make Better Photos - NOW! One of the great advantages of applications such as Adobe Lightroom is the ability to produce a Virtual Copy of any camera-based image within your database. This allows you to experiment with both the original color file and, for example, a black-and-white version of that same image. Black-and-white photography will allow you to open yourself up to a whole new world of adventure and fun and, in doing so, allow you to discover and cultivate your very own, unique creative potential. If you live in or around Melbourne, Australia and you’d like help understanding how to use your camera or, alternatively, you want to learn Lightroom feel free to contact me directly to discuss options for a private, one-to-one photography class.